Could Atlus' anticipated "adult horror" game be heading to Western shores after all? Few games have garnered so much interest purely on concept like Catherine has. Atlus' Persona team had previously shown its ability to tackle mature concepts such as sexuality and gender identity in Persona 4, after all, and here was a game that revolved around all of that stuff - can you blame us for being excited? Alas, last week we learned it was not to be: Atlus had "no plans" to bring the game out of Japan. Oh well, better luck next time, right? 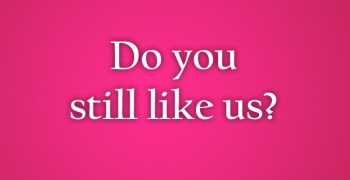 Shortly after the "Catherine isn't coming to the West" story broke, Atlus sent out an email to its fans and media outlets containing a single mysterious image with the words "Do you still like us?" against a hot pink background. Said background was more than a little reminiscent of Catherine's box art, leading many to hypothesize that the game would indeed be heading across the Pacific. The plot thickened further when sharp-eyed internet hawks caught a listing for the game on GameStop's website, with a North American release date of July 26th. Said listing has since been removed, but as we all know the internet has a long memory (and long cache times). It's hardly a definitive confirmation, to be sure. But it is some pretty substantial evidence hinting at a Catherine localization, even if we won't know for sure until Atlus confirms (or denies) its plans. VG247 claims that the localization will be announced tomorrow, so we might not have long to wait either way.